I didn’t want to get sucked into watching the XXXI Games of the Olympiad or the Rio Games if you prefer, but I did. With everything going in the world, there are some truly heart-warming moments and some good athletic contests to be seen. So, I’ve watched. I’m constantly amazed at how split seconds can make a difference in the events. For example, in the 200 meter Men’s Butterfly swimming finals yesterday, .50 seconds separated first place from fourth place. One half of one second. Clap your hands. The silence in between was the difference. Michael Phelps won with a time of 1:53.36. His rival Chad le Clos finished with a time of 1:54.06. AND, there were two swimmers in between them. No medal for Chad. The announcers are knowledgeable and talk about what techniques might have improved the times. Little things can make a difference. And the announcers get OH SO EXCITED during the competition that it PUMPS the viewer UP. You can’t help but watch. Now I am punctually challenged. I constantly struggle to make it to work on time. So, I was wondering what it would be like to have those Olympic announcers analyze my morning habits as I struggle to make it to work on time. Vince (his voice whispers): His alarm is scheduled to go off at 6:50 which is just moments away. Lou: He has the challenge of his life this morning. He needs to be OUT OF THE DOOR by 7:30. Lou: There goes the alarm and he’s off. OH NO. He HITS THE SNOOZE. Lou: LOOK! Johnny is heading STRAIGHT to the shower with a toothbrush AND a razor TRYING to cut some time OFF his routine. Vince: THIS is going HAVE TO BE to be an EPIC shower. Lou: He can’t wait too long for the water to warm up. Lou: Well Vince, he missed a few whiskers RIGHT BELOW his nose, but other than that, it was a GOOD run in the shower. 5 minutes and 36 seconds. Vince: I notice he has his clothes laid out already. THAT should be a help. Lou: Vince I don’t really think it matters, but he has BROWN socks and BLACK shoes. Vince: It doesn’t matter if he MATCHES or not at THIS juncture as long if he’s OUT the door by 7:30. Vince: Underwear, tee shirt and socks are all on. JUST the pants and shirt to go. And Lou, LOOK at this. I CAN’T BELIEVE HE’S GOING TO TRY THIS THIS MOVE! Lou: NOBODY has EVER accomplished this feat before. HERE’S THE HOP. OOOOH. And he HITS the ground hard. Vince: I know this is the Olympics, Lou, BUT Johnny NEEDS to learn, you’ve JUST GOT to put your pants on ONE LEG at a time. Lou: You know, for a MOMENT there, it looked like he had it. But he caught his LEFT toe in the RIGHT belt loop as he HOPPED for the trouser legs. Vince: Well, he’s got his pants ON now, the traditional way, and he’s putting on his shirt. Lou: If he picked the polo, he’d have less buttons to contend with. Buttons are seconds and SECONDS are important! A PULLOVER would be even faster! Vince: Johnny’s gonna HAVE to button MOST of those buttons IN THE CAR. There’s no time to lose after that fall. Vince: Johnny grabs a cup of coffee now and is headed for the door. Lou: LOOK AT THIS, Vince. He opts to drink it BLACK. The cream and sugar would JUST take TOO much TIME to add. Vince: He drank black coffee in training JUST for THIS moment. Lou: He’s OUT the door. 7:31. JUST A MINUTE off the target mark, but a VERY good run. Vince: Quite the improvement from the 7:42 departure time just yesterday even WITH the snooze. 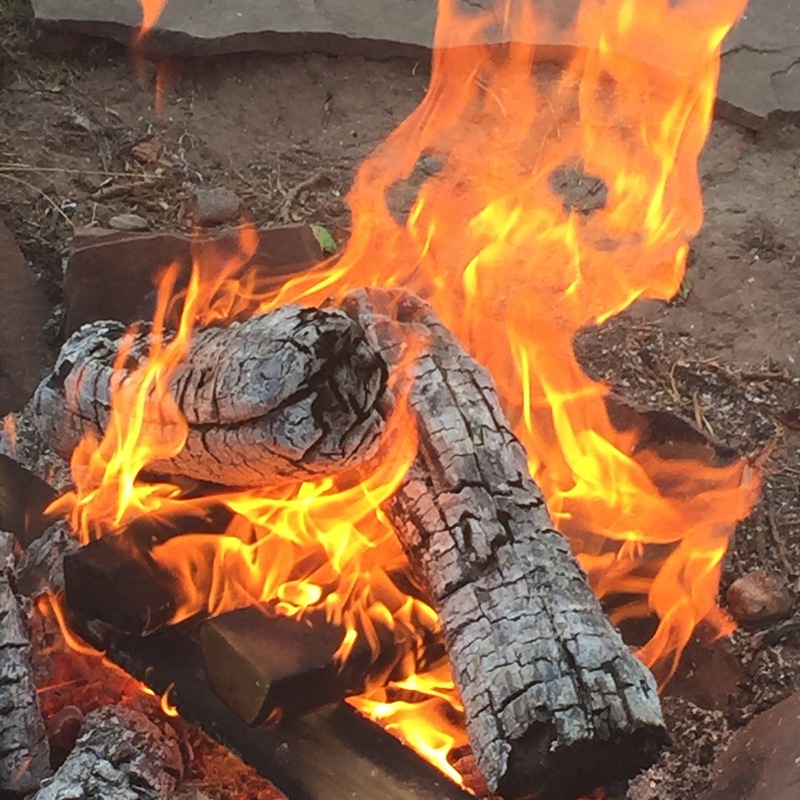 FOOTNOTE: Cover photo: A Campfire in Colorado is the “Eternal Flame”: for this narrative.